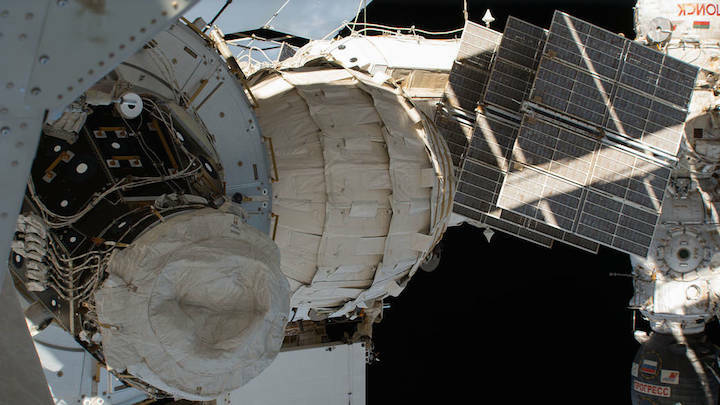 The Bigelow Expandable Activity Module (BEAM) is seen attached to the Tranquility module of the International Space Station. BEAM is an is an experimental expandable habitat. Expandable habitats, occasionally described as inflatable habitats, greatly decrease the amount of transport volume for future space missions. These “expandables” weigh less and take up less room on a rocket while allowing additional space for living and working. They also provide protection from solar and cosmic radiation, space debris, and other contaminants. Crews traveling to the moon, Mars, asteroids, or other destinations could use them as habitable structures. On Sept. 29, 2016, Expedition 49 Flight Engineer Kate Rubins opened up the BEAM for tests and equipment checks. Rubins entered the module and temporarily installed gear inside BEAM for a test to measure the loads and vibrations the module experiences. BEAM, the new expandable module attached to the International Space Station, was opened up today for tests and equipment checks. The Expedition 49 crew also explored eating right in space, adapting to new technology and studied a variety of other life science and physics research. Flight Engineer Kate Rubins opened up and entered the Bigelow Expandable Activity Modulethis afternoon. She temporarily installed gear inside BEAM for a test to measure the loads and vibrations the module experiences. Rubins started her day with a performance test on a mobile tablet device then videotaped her observations of the living conditions aboard the space station. Japanese astronaut Takuya Onishi started an 11-day run today to document his meals while wearing a monitor that will take water samples and measure his breathing. The ENERGY experiment will help doctor’s understand metabolism in space and ensure astronauts are properly nourished to maintain the energy required for a long-term mission. Onishi is also continuing to set up the Group Combustion fuel burning study and checked for pressure leaks in the experiment gear. In the Russian side of the orbital laboratory, Commander Anatoly Ivanishin resumed studying charged particle systems trapped in a magnetic field. He also participated in a pair of Earth photography experiments observing how natural and man-made disasters including industrial activities affect the land and sea.